All-Terrain Vehicles (ATVs) can be an excellent tool on the farm or ranch, but an ATV accident can really slow you down or worse. Keep these tips in mind to prevent ATV accidents and get the job done the first time. Use a spray tank that has internal baffles. They will reduce liquid surges and improve your overall stability when turning on slopes or hills. Choose booms that can be operated as low to the ground as possible and tanks that are easy to flush. Don’t use an inferior spray system. ATVs should only be fitted with rear-mounted spray booms or other equipment that reduces the risk of pesticide exposure to the operator. Don’t ride and spray if you have to hold a wand or lance. 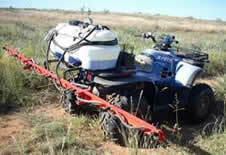 If you’re using this setup, make sure the ATV isn’t moving while you’re spraying. Spray only in ideal wind conditions. The optimal speed for good spray distribution is probably slower than you’d like. High speeds mean higher chances of missing your target, and worse, possibly losing control of the machine. On hills, always lean your body uphill to prevent tipping & flipping. Bigger and faster is not always better—a smaller machine is easier to move by hand if necessary (e.g. if it flips on you).